India's most famous monument, the Taj Mahal is also the most perfect mausoleum of Arab-Indian architecture. This page explains when, how and why it was built, but it also gives information about its history through the years. But first of all it should be noted that its history is very unrestrained, the Taj Mahal has, so to speak, not experienced any modifications, improvements, or suffers any particular damage, it is delivered to us in a form very similar to that it was in the seventeenth century. The Taj Mahal is a 17th century building. In the history, it is placed in the middle of the eighteenth century. At that time, in northern India, the reigning dynasty was the Mughals, which had begun in 1526 under Bâbur (1526-1530) when this warrior leader succeeded in defeating the late Sultan of Delhi, Ibrahim Lodi, during the battle of Pânipat. At that time Bâbur was the first empire he made to grow. His successors were Shah Jahan (1627-1658) and Aurangzeb (1658-1707), in the order Humâyûn (1530-1540, then 1555-1556), Akbar (1556-1605), Aurangzeb (1605-1627) was the last great Mughal emperor. Later the Empire lost its power and the long list of other sovereigns had little power over the old territory. The 5th Emperor, Shah Jahan, was the originator of the Taj Mahal. Shah Jahan was a brilliant child, an applied pupil, who quickly demonstrated great skill, both on the battlefield, where he expanded his father's territories, and in politics. After succeeding his father he successively married 3 women, the third of whom, Mumtaz Mahal (1593 - 1631), was his favorite. The chroniclers of the time said that the agreement between the two spouses was perfect, so when Mumtaz dies in 1631, Shah jahan orders the construction of a great mausoleum in which she can rest for eternity. It should be noted that the body of the emperor will be placed next to him, later, and this despite the fact that he remarried several times. The Taj Mahal is therefore only a tomb, but an exceptional grave. It is at the crossroads of Moghole, Indian, Persian and even Syrian architecture. The overall quality of the site is recognized as one of the most beautiful sites in the world. Learn more about historical context of the Taj Mahal. The construction of the Taj Mahal began in 1632 and ended in 1643 for the mausoleum, but only in 1648 for the rest of the complex, ie the inner courtyard and the gardens. The choice of location was made quite naturally because to the east of the city of Agra were all the palaces of the lords of Agra, it was the residential area of ​​the nobility of the Moghul Empire. As the water has a strong symbolism the mausoleum should be on the banks of the Yamunâ, the river that passes through the city. 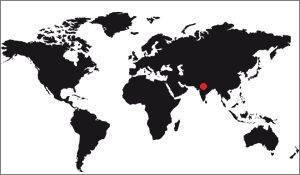 Thus was chosen the location of the Taj Mahal. Then it was necessary to make a choice of architects. To be sure not to be mistaken, Shah Jahan did not take one but 9, who worked together. History has not left much information about the builders of the monument, but that of Ustad Ahmad Lahauri is probably that of the main architect, who was in regular communication with Shah Jahan to understand and transcribe his wishes. If one believes the rare documents and chronicles of the time the Taj Mahal was not built of a block, but by end. After the construction of the work area and the organization of the construction site, the main works were the elevation of the north terrace and the construction of the mausoleum, the highlight of the construction. The rest of the complex arrived a little later, especially the gardens and the inner courtyard. The inscriptions on the South Gate, and in particular the various signatures of Abd-ul-Haqq, the calligrapher who inscribed the inscriptions in the buildings, indicate that this door was begun before the end of the mausoleum and was finished thereafter. The history of the Indies tells us that Shah Jahan was deposed by his son and spent the last 8 years of his life in prison, at the fort of Agra. At his death he was simply buried at the side of his wife in the Taj Mahal. Learn more about the construction of the Taj Mahal. The Moghul Empire, which was created in 1526, began its decline from the Emperor Bahadur Shah in 1707. From that date until 1857 there were many successors who lost power and power. territories, until the British colonization, in 1857. During this period we do not have any information on the evolution of the Taj Mahal. It is easy to imagine that the monument was regularly maintained, for the Mughals were Muslims and the Taj Mahal was a representation of the afterlife as practiced by the practitioners. It is therefore not mistaken to say that the gardens were maintained and improved, and that the mausoleum was respected. Moreover, there is no trace of any degradation, or even improvements, between Shah Jahan's original plan and the monument as it is today, proof that he has gone through the history without a hitch. In 1857 the British Empire took power over India. It was the result of an Indian rebellion in the country, a rebellion that was mitigated by the colonizer. 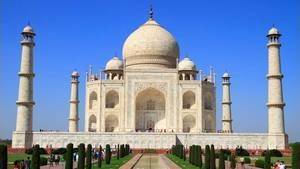 During the year the Taj Mahal undergoes some degradations since it is quoted English engaging the precious stones incrusted in the monument. Some have been detected, but we have little information on the extent of the damage and its repairs. 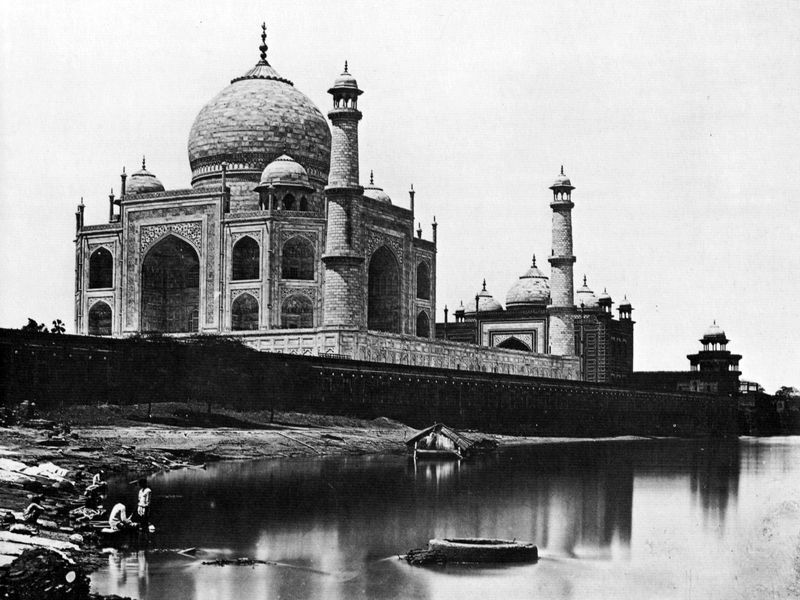 The Taj Mahal in 1865 by Felice Beato, one of the first pictures of this monument. The English, the western colonizing people, reacted like almost all other Westerners, that is, they imposed on the colonized a part of their cultures without too much regard for the existing traditions and religions. The Taj Mahal, seen by the English, is not a representation of Paradise, it is only a garden like the others. They did what was unthinkable before: They made a great restoration at the monument. The latter was initiated by Lord George Curzon, governor general of the Indies from 1899 to 1905, and incidentally provocative of a large family in the north of India, famine which made between 1.5 and 4 million dead. 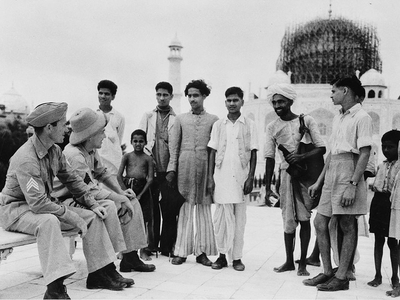 This singular person directed the restoration works of the Taj Mahal which were completed in 1908, after his departure. They consisted in the removal of a large part of the trees, plants and flowers to make perfectly orderly square lawns, a so-called "French garden." If the result is magnificent, it no longer corresponds to the origin of the project. However, it does not seem to be very serious, since Islam was back in this region at that time. Moreover, at the end of the British colonization, the Indians did not recreate the original garden, but merely preserved the lawns, the ones that can still be seen today. The idea was to make wooden protections around the dome, but above all to hide it from the aerial view, so as not to make it an easy target to detect. The enemy at that time was the Luftwaffe aircraft. Before the end of the war, Japan also tried to target the Taj Mahal, hence the interest of these scaffolds. They were still used between 1965 and 1971 during the Indo-Pakistan War. In 2001 another crisis broke out between these two neighboring countries. The security of the Taj Mahal was further strengthened, and it was envisaged to cover it with large khaki canvases to prevent its being spotted: It must be known that the Sun's reverberation can be seen at 40 km distance, which is much , anyway. Nowadays the biggest risk for the Taj Mahal is that of pollution and mass tourism, two blights that place the site in different, albeit related forms. Mass tourism brings to the site a large number of visitors who need to be housed, nurtured, and to organize their comings and goings. Lawns suffer, naturally, from this world, but also the buildings, the mosque, and so on. The pollution is much worse because it slowly degrades the white marble and the lapidary inlays of the mausoleum, the South door, and all the decorations that can be found everywhere. Fortunately, the Indian government has taken measures by defining a "trapeze", which is why it has named a geographical area around the monument, which is subject to great restrictions on road traffic and polluting plant installations. It is through such actions that the Taj Mahal will be able to stand for many more years.